Saint Hyacinth, a Saint Discarded, but oh so Necessary!! Sadly, the Modernists who decided that Saint Hyacinth wasn't for the calendar anymore...bad decision! 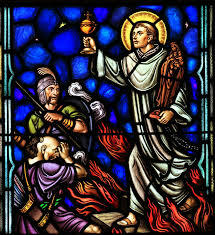 He was one of St Dominic's spiritual sons who was a timeless Saint for evangelization... but then THEY knew that and so...remove him from the calendar but the Traditional Latin Mass calendar makes sure he is celebrated. Big mistake that the Modernist cabal figured the Latin Mass would never resurface. St. Hyacinth, a great ornament of the celebrated Order of Preachers, was born in Poland. He was the son of illustrious parents, who educated him according to the dictates of Christianity. During the years devoted to his studies, he was an example of innocence, piety and industry. His uncle, the bishop of Cracow, appointed him canon in his cathedral, so that he might employ him in the administration of his See. When he left for Rome, on account of troubles at home, he took Hyacinth with him. 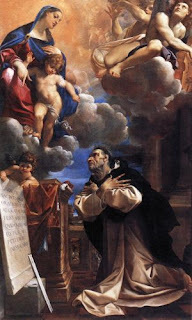 St. Dominic, so celebrated for his apostolic zeal, and for the miracles he wrought, was there at the time. Hyacinth, observing the wonderful zeal and piety of this holy man and of his companions, felt a growing desire to join them. He and three of his fellow-travelers, who had the same inclination, went to St. Dominic and begged him to receive them into his newly founded Order. The Saint received them willingly, and instructed them how to lead a religious life, to preach in a Christian spirit, and to labor successfully for the spiritual welfare of men. After a few months, the holy founder had so thoroughly imbued them with his spirit, that he did not hesitate, after they had taken their vows, to send them into their native country, to preach the word of God and promote the salvation of souls. At Cracow, where St. Hyacinth had formerly preached by his edifying life, he now began to preach with words, and God gave them such power, that he reformed the most hardened sinners, induced others to become more zealous in the service of the Almighty, and animated all to be more solicitous for the salvation of their souls. 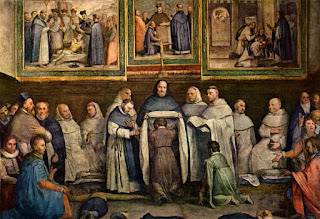 That all this might have a more solid foundation, he gathered a number of spiritual co-operators about him, and having instructed them according to the maxims of St. Dominic, he established a Dominican monastery at Cracow. Hyacinth, who had been chosen superior by the new members, was an example to all. Besides the prescribed fast-days of his Order, he fasted all Fridays and vigils on bread and water. The greater part of the night he passed in fervent prayer, before the Blessed Sacrament. He allowed himself only a very short rest on the bare floor, and scourged himself severely every night. The whole day was occupied with hearing confessions, preaching, visiting the sick, and similar pious exercises. He had particular devotion to the Blessed Sacrament and to the Blessed Virgin, and never undertook anything before offering his work to God and begging the assistance of His Blessed Mother. She appeared to him once, on the eve of the feast of her Assumption, saying to him: "Be assured, my son, that thou shalt receive everything thou askest from my Son." The comfort these words afforded the holy man may be easily imagined. He, however, asked only for what was necessary for the salvation of souls. His own and his companion's pious labors were all directed to the same end. When he thought that he had firmly established religious principles and practices among the inhabitants of Cracow and the whole diocese, he sent his preachers to different places to labor in the same manner. He himself also left Cracow, and it is astonishing how many countries he journeyed through, how many convents he established everywhere: for apostolic laborers, how many souls he converted to the true faith or to a more virtuous life. To aid his pious endeavors, God gave him power to work miracles, and so great was their number, that he might well be called the Thaumaturgus, or wonder-worker of his age. A miraculous event occurred in Russia, when the Tartars stormed Kiow, where the Saint had founded a church and convent. He was standing at the altar when they entered the city, spreading destruction and desolation around them. After finishing the Holy Sacrifice, the Saint, still in his priestly robes, took the Ciborium containing the Blessed Sacrament, and telling his priests to follow him without fear, he went towards the church door. When passing a large alabaster statue of the Blessed Virgin, before which he had often said his prayers, he distinctly heard a voice saying: "My son Hyacinth, wilt thou leave me here to be at the mercy of my enemies?" The Saint's eyes filled with tears. "How can I carry thee? " said he; "the burden is too heavy." "Only try," was the response; "my son will assist you to carry me without difficulty." The holy man with streaming eyes, took the statue and found it so light, that he could carry it with one hand. Thus, carrying the Ciborium in one hand and the statue in the other, he and his companions passed through the enemy unassailed, to the gates of the city. Not finding any soldiers there, they passed on and reached Cracow in safety. Whether Almighty God made His servants invisible to the Tartars on this occasion, or in some other manner prevented them from harming them, is not known; but it is a fact that they left the city unmolested. When they reached the river over which there was no bridge, nor a boat to convey them across, the Saint, trusting in the power of Him Whom he carried in his right hand, and in the intercession of her whom he held in his left, fearlessly stepped upon the water, and crossed it with dry feet. A similar, and perhaps still greater miracle happened at another time. He was going to Vicegrad to preach, but, on reaching the river, found no vessel which he could use to reach the opposite bank. Spreading his cloak on the water, he sat upon it, and was floated safely across and brought his companions over in the same manner. By this and many other miracles, God glorified His servant even on earth. 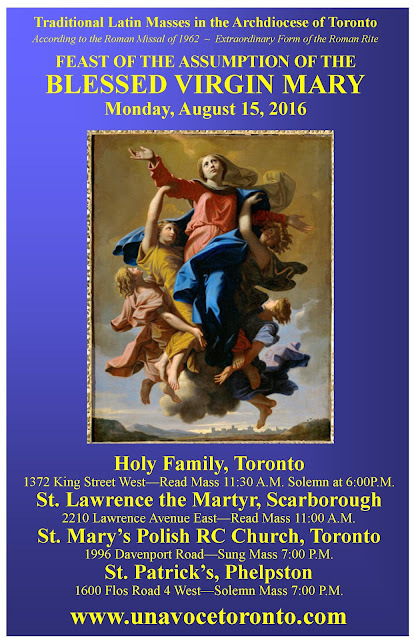 For forty years this holy man had labored for the salvation of souls, when, in 1257, it was revealed to him that he should assist, in Heaven, at the triumph of the Blessed Virgin, on the feast of her glorious Assumption. On the feast of St. Mary ad Nives, he was taken sick. On the eve of the Assumption he gave his last instruction to the priests of his Order; after which he prepared for the festival, and, having recited the office of the day, he fixed his eyes on heaven, and said the psalm, "In thee, O Lord, have I hoped," to the words, "Into thy hands I commend my spirit," when he calmly expired, at the age of 74. The innocence and chastity which he possessed at the time of his baptism, remained unspotted until the end. After his death, the miracles which the Almighty continued to work through this Saint, were the means of proclaiming to all the world, the sanctity and merits of His blessed servant. I. St. Hyacinth, carrying the Saviour of the world in one hand, and in the other, the statue of the Blessed Virgin, walked past his enemies through the city. Happy are they who carry Jesus and Mary, not only on their lips, but also in their hands! They will ever walk safely amid dangers, unharmed by the enemies of their salvation. Some carry Mary alone on their lips, not Jesus; they make some show of being devout to the Blessed Virgin, by saying certain prayers; but they offend Jesus, the Divine Son of Mary, most grievously, flattering themselves that, by their devotion to the Blessed Virgin, they are secure against the fire of hell. This is a terrible deceit of Satan. Such devotion is no devotion to the Divine Mother; as, to be devout to her, it is required, above all things, to do nothing which is displeasing to her, but to do all that is agreeable in her sight. As, then, neglect of her Divine Son, Whom she loves above all, must be displeasing to her, how can anyone hope for salvation when his whole devotion consists in a few prayers or pious acts? One who does this, divides Jesus from Mary. You must carry Jesus and Mary at the same time, and not only in your mouth, but also in your hands. You must show, by your works, that you love both with your whole heart. If you love Jesus, see that you do not offend Him; if you love Mary, arouse not the wrath of Him Whom she loves above all things. Such devotion will shield you against all dangers to your salvation, and lead you to everlasting peace and rest. 2. For forty years St. Hyacinth was devoted solely to the glory of God and the salvation of souls. He has now enjoyed, for more than five hundred years, the heavenly joys in recompense for his labors, and he will enjoy them for all eternity, O! how richly God rewards the services of His elect! "If, for one hundred years of service, He bestowed one hour of Heavenly bliss, the reward would be great," says St. Chrysostom. How grateful should we be, when, as the true faith teaches us, He promises us an eternal reward in Heaven for such short service! Who would not serve, with pleasure, so bountiful a Master? How blind and foolish are those who prefer to serve Satan! Does Satan reward his servants more liberally than God? Ask the reprobate; they will tell you. Listen to what the Almighty said, in times long past, of the difference that will, one day, be between His servants and those of Satan, and then resolve which you will serve; "Behold!" says He, "my servants shall eat, and you shall be hungry; behold, my servants shall drink, and you shall be thirsty. Behold, my servants shall rejoice, and you shall be confounded; behold, my servants shall praise for joyfulness of heart, and you shall cry for sorrow of heart, and shall howl for grief of spirit (Isaias, lxv)." What else does this mean but: "My servants shall be eternally happy in Heaven, but you shall be eternally unhappy in hell." One of the loveliest lilies from the Dominican field today unfurls its petals at the foot of Mary's throne. Hyacinth represents on the sacred cycle that intrepid band of missionaries who, in the thirteenth and fourteenth centuries, faced the barbarism of the Tartars and Mussulmans which was threatening the West. From the Alps to the Northern frontiers of the Chinese Empire, from the islands of the Archipelago to the Arctic regions, he propagated his Order and spread the kingdom of God. On the Steppes, where the schism of Constantinople disputed its conquests with the idolatrous invaders from the North, he was seen for forty years working prodigies, confounding heresy, dispelling the darkness of infidelity. Great was thy privilege, O son of Dominic, to be so closely associated to Mary as to enter into thy glory on the very feast of her triumph. As thou occupiest so fair a place in the procession accompanying her to heaven, tell us of her greatness, her beauty, her love for us poor creatures, whom she desires to make sharers, like thee, in her bliss. It is through her thou wert so powerful in this thy exile, before being near her in happiness and glory. Long after Adalbert and Anscharius, Cyril and Methodius, thou didst traverse once more the ungrateful North, where thorns and briars so quickly spring up again, where the people, whom the Church has with such labour delivered from the yoke of paganism, are continually letting themselves be caught in the meshes of schism and the snares of heresy. In his chosen domain, the prince of darkness suffered fresh defeats, an immense multitude broke his chains, and the light of salvation shone further than any of thy predecessors had carried it. Poland, definitively won to the Church, became her rampart, until the days of treason which put an end to Christian Europe. Almost innumerable miracles were worked at his tomb, including the raising of as many as fifty persons from the dead. He was canonized A.D. 1594 by Clement VIII., and Urban VIII. extended the celebration of his festival to the universal Church. O God, who didst make Blessed Hyacinth, Thy Confessor, glorious amongst the people of divers nations for the holiness of his life and the glory of his miracles, grant that by his example we may amend our lives, and be defended by his help in all adversities. Through Christ our Lord. Amen. Was the Homo Lobby active at World Youth Day? 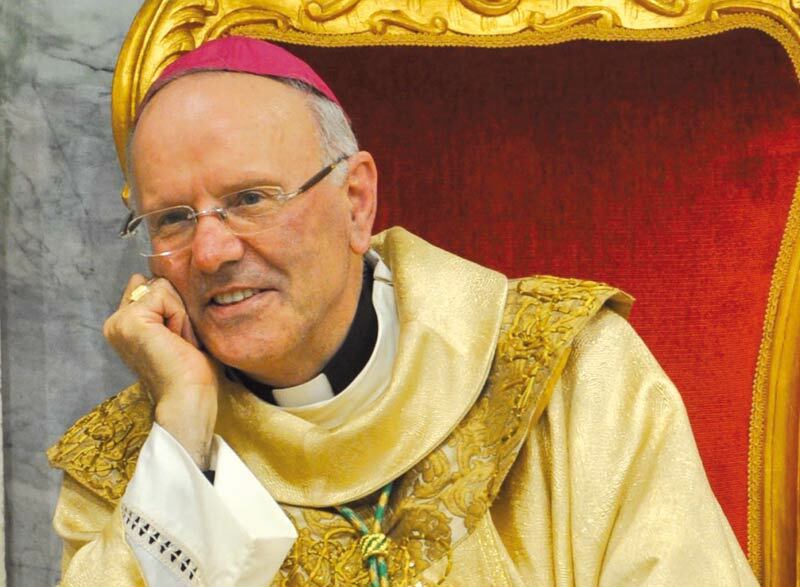 Just what was Homosexualist Bishop Galantino saying about Sodom? I have been reflecting for a while as to why Catholic churchmen are doing such a bad job at promoting and defending the sanctity of Holy Matrimony. Again and again, I keep coming back to my belief that it is because the vast majority are homosexuals themselves, if not practicing homosexuals. Fr. 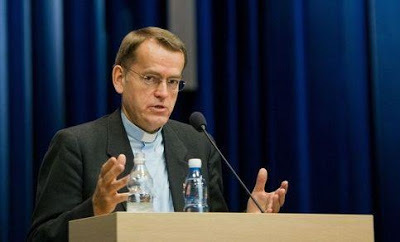 Dariusz Oko has written and spoken of the homo lobby that is the 'dark side' of the Church. It goes without saying that a homosexual is not too interested in defending - let along promoting - the sanctity of marriage. So what do sodomite churchmen do to continue the facade? Simple, a nominal support on paper of Holy Matrimony, but no real effort to defend, promote, encourage, teach the truth about the Sacrament of Holy Matrimony. Fr. Z reports on the very disturbing case of an Italian Bishop Nunzio Galantino regarding his strange presentation on the biblical account of Sodom and Gomorrah. So, what’s his game here? Is it to put into the empty heads of these young people that God did NOT destroy Sodom and Gomorrah (i.e., rewrite the Bible) because He does not abominate the “sin of Sodom”? Sure, Bp. Galantino underscores Abraham’s intervention. Fine. It’s great to underscore what Abraham tried to do, but NOT at the expense of the truth about what happened to Sodom and Gomorrah! As good and as positive as Abraham was, it didn’t work, except for poor Lot. Moreover, when Abraham asked God to spare the cities because there might be good people in them, he is in no way condoning what the evil people did! Abraham seems to be fine with destruction of the wicked. He doesn’t want the innocent to be destroyed because of and together with the wicked. The fact that such a thing might take place at a World Youth Day is dreadful. Also, I think it is a stinging condemnation of the catechetical and biblical preparation of young people today, that anyone would think that he could get away with this. Is it any wonder that homosexuality, bisexuality, pansexualism is spreading? How could it not be, with, for example, the "Theology of the Body" (TOB) crowd promoting, excusing deviant sexual acts between husband and wife, and this under episcopal endorsement?